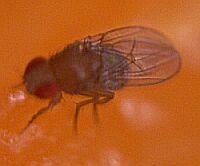 This is the common fruitfly which swarm any food items left open, particularly fruits. The fly is very small, just about 1.5 to 2 millimeters length. Here, it is seen feasting on a piece of pumpkin. Yes, I agree, Seth, but this was the clearest of the 20+ shots of the fly I took. It is so small that it is very difficult to see on the lcd whether it is correctly focused. After that I had to do a little bit of rework. A good macro lens might have come in handy, I suppose. BTW, I understand the name is Drosophila, not 'fila'. Any idea how to correct the caption?